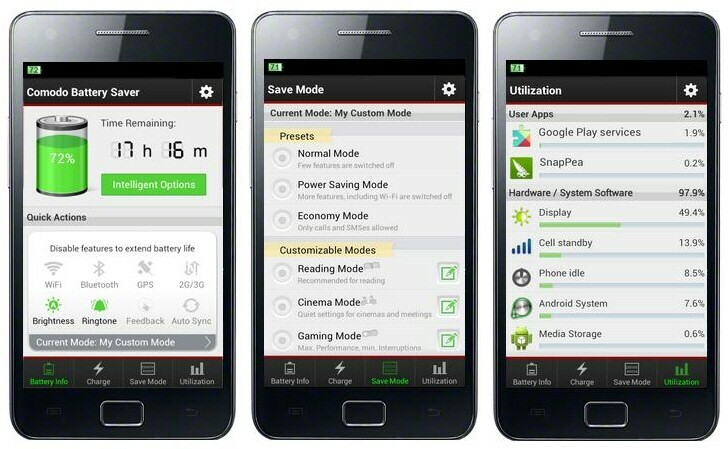 Comodo Battery Saver is an Android app which aims to extend your device's battery life. Run Battery Saver and it monitors your battery level, automatically turning off the most energy-sapping features when it's getting low. Which features? By default it uses "Economy Mode", which turns off almost everything, but there are various other presets available ("Reading Mode" for reading, "Cinema Mode" keeps your device quiet in meetings, "Gaming Mode" delivers maximum performance with minimum interruptions). You can also build a Custom Mode which only adjusts the settings you choose (screen timeout, brightness, vibration, wifi, mobile network, auto sync, Bluetooth, touch feedback). Tap Settings > Intelligent Options and you can have Battery Saver switch to your preferred mode when the battery level drops to a certain level. A scheduler optionally switches modes at a specified time range (use 23:00 - 08:00 to turn off most features at night, say), and the app can also disable features when your device is locked. Once you're set up, the app's Battery Info page will keep you up-to-date with your current battery level and how long you've got until it's exhausted. You're able to manually change profiles here, as well as manually enabling/ disabling key features (wifi, GPS, Bluetooth and more) with a tap. If this still doesn't deliver the results you need, Battery Saver's Utilization page displays your most power-hungry apps, and stops or uninstalls them in a couple of taps. And the app also keeps you informed with an alert when you device can be unplugged from charge, and status bar notifications on your current battery levels. There's a limit to what this kind of tool can do, but Comodo Battery Saver's range of features and configurability mean it should make a real difference to your battery life.